Panama Dive Center | Where are Coiba and Santa Catalina? Thanks to the creation of a penal colony on Coiba Island (1919-1991), seventy-five percent of the island is untouched, ancient forest that teems with exotic birds and other animals. Home to some of the many criminals and many political prisoners, few people dared come too close to the island, which had the excellent consequence of keeping the woodlands safe from loggers and poachers. Untouched also is ocean’s bottom surrounding the chain of islands, which is linked to Coco’s and the Galapagos Islands by the underwater Coco Ridge mountain chain. Turning it into a National Park in 1992, the Panamanian government has succeeded in protecting the 760 different species of fish that can now be found here. In 2004 UNESCO declared Coiba National Park a World Heritage Site. 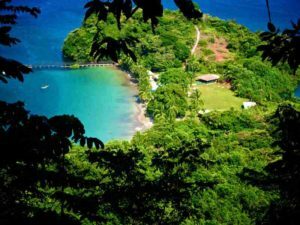 Santa Catalina is a small fishing village located three hours from Santiago and seven hours from Panama City. It is the shortest boat ride from the mainland to Coiba Island and the National Marine Park. There are two small grocery stores, fruit and vegetable sellers and many hotels and restaurants that cater to all budgets. The nearest main town is Soná, located just over an hour away by bus. It is still relatively small, but there you will find larger supermarkets and facilities including a post office and internet cafés. There is also no ATM or bank in Santa Catalina, so make sure you bring enough cash (although by now many establishments, including us, accept credit cards as well). Santa Catalina is now also a tourist destination, and much of the small community’s income and industry is derived through tourism. In the high season (from December to April), hostels fill up, whilst in the low season the town feels like a sleepy village where you can lose yourself in the slow pace of life. Activities include of course diving, but also surfing (location of the ISA Reef World Surfing Games, 2013), paddle boarding, yoga, kayaking, hiking, and horseback riding. There are two beautiful beaches where you can relax and if you dare to, you can attempt the 1.5 kilometer swim out to Santa Catalina Island. From Panama, take the Interamericana all the way to Santiago de Veraguas. If you don´t have a GPS, it is best to ask to make your way onto Route 4 towards Soná. Just before reaching Soná, you´ll find a turn-off (Delta petrol station) to the left that leads to Santa Catalina. The whole trip usually takes about 5 hours. From Panama it is best to take an early morning bus (before 10am) from Albrook Bus Station to Sona (five and a half hours). From Sona, take a bus to Santa Catalina (one and a half hours). Note that the last bus form Sona leaves at about 4.30 and there are no hotels there. If you miss the bus, the only option is a taxi (about $40).If you are coming from Boquete or Bocas del Toro, you can get a bus to Santiago, then take a bus to Sona, and then another one to Santa Catalina. If you are in a hurry or prefer the comfort of a private car without driving yourself, you can get a taxi to come fetch you at the airport or your hotel and he will take you straight to Santa Catalina. Just ket us know and we will arrange this for you. If you are coming from Boquete ($35), you can get a shuttle (organized by ´Hola Panama´) to Santa Catalina. Count on a four to five hour journey .